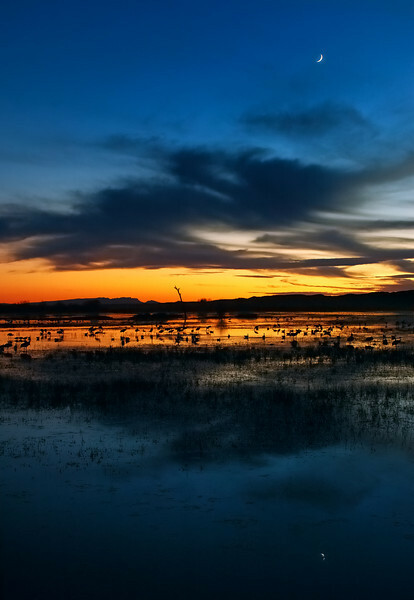 Sundown at Bosque del Apache National Wildlife Refuge in New Mexico. While we were there they estimated that there were 50,000 Snow Geese and over 6,000 Cranes in the area. You can see quite few of each if you view this large. This is the same pool at the refuge that served as a backdrop for the star trails shot I posted earlier here ( http://flickr.com/photos/fortphoto/306582484/ ) . To view a close up of the crescent moon setting into the sunset on the previous evening west of this location look here ( http://flickr.com/photos/fortphoto/308860098/ ) .